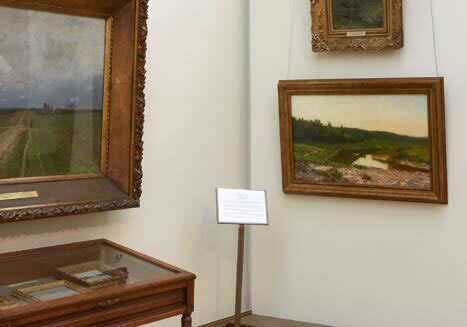 Previously assumed lost, the artist's "Summer Day", painted during his stay in the Vladimir region in the summer of 1892, is on display at the Tretyakov Gallery. EVERY WORK BY THE EMINENT LANDSCAPE ARTIST ISAAC LEVITAN, WHETHER HIS LARGE FINISHED COMPOSITIONS OR SKETCHES FROM NATURE, HIS DRAWINGS OR Refined pASTEL pIEcES, IS A "SwEET Melody" ABOuT RuSSIAN NATuRE – A MELODY WHICH SOUNDS SOMETIMES CLEARLY AND CHEERFULLY, SOMETIMES TENSELY AND ANXIOUSLY, BUT ALWAYS EARNESTLY AND EMOTIONALLY. LEVITAN'S APPRECIATION OF RUSSIAN CULTURE, IN WHICH HE WAS RAISED BOTH AS AN ARTIST AND AS AN INDIVIDUAL, AND WHICH HE KNEW AND LOVED, MADE HIM ONE OF THE MOST SENSITIVE LANDSCAPE ARTISTS WHO EXPRESSED THE NATIONAL ESSENCE AND THE INNERMOST MYSTERY OF THE COUNTRY'S NATURE. AS ALEXANDRE BENOIS CHARACTERISED HIM: "A SENSITIVE AND GREAT ARTIST." In mid-May 1892 Levitan, together with his faithful companion Sofia Kuvshinnikova, who always accompanied him on his summer travels and painting trips, left sun-scorched Moscow for a location close to Vladimir, where they stayed at the Gorodok estate near Boldino railway station, along the Nizhny Novgorod railway line 120 kilometres from Moscow. 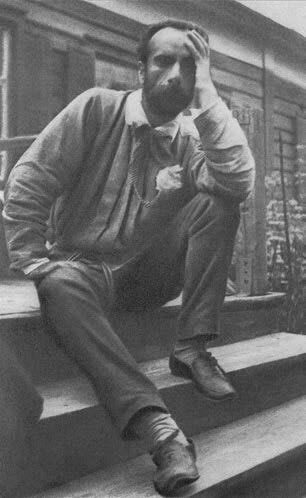 1892 was a difficult year in the artist's life and fate. As a Jew, he was yet again subjected to humiliating expulsion from Moscow. Moreover, there was a risk that he would be ordered to live in the Pale of Settlement, despite his wide popularity and the full recognition of his talent. Such difficulties, in addition to the necessity to paint outdoors in summer, explain why Levitan spent not only the summer near Boldino, but also stayed there for the autumn and the beginning of the winter as well, returning to Moscow only in December. For Levitan the summer was always a period of fruitful and pleasurable work. Early each autumn he usually returned with dozens of painted sketches, numerous albums with drawings, and often paintings, recently started or even already finished: the artist would bring his large compositions to perfection back in his Moscow studio. Every year he had to have his summer pieces finished before the exhibition season, which started in the late autumn or in winter, and to show them at the most important shows. These included, first and foremost, those organised by the "Peredvizhniki" (Wanderers) society, at which many other artists, as well as Levitan, looked forward to displaying their most cherished works. In summer 1892 Levitan followed his usual practice. The environs of Vladimir, with their forests and groves, quiet streams and small lakes attracted the artist both as a place for work and a place for hunting, his favourite pastime. 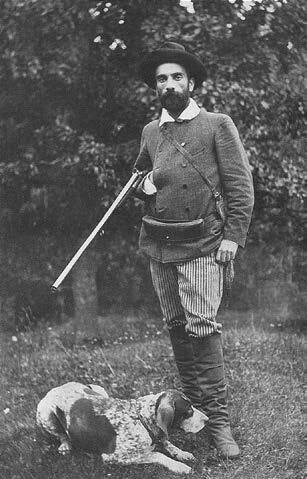 Armed with a gun and accompanied by his faithful dog, Vesta, he would spend several days at a time out in the fields or woodlands. Such "hunter's holidays" afforded him the chance to experience complete union with nature and to listen attentively to its voices, and nurtured his understanding of the ideal of a landscape artist - an understanding which provided Levitan the ultimate joy of "hearing how the grasses vegetate". The "harvesting" season in summer brought its "trophies" -large compositions which have long been considered landmarks in the wider history of Russian landscape painting, among them the famous "Vladimirka Road" (1892, Tretyakov Gallery), "Forested Riverside. Twilight" (1892, Tver Picture Gallery), "Vesper Bell" (1892, Tretyakov Gallery), "Autumn", "Toward the Evening", and "Fire in a Forest" (all from 1892, in private collections). They all were shown at the 21st "Peredvizhniki" exhibition that opened in St. Petersburg on February 14 1893. The artist worked hard to have them finished by the time the show opened. 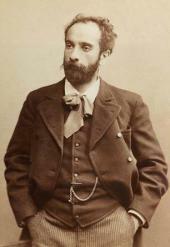 In the previous year, 1891, he had become a permanent member of the "Peredvizhniki" society, and took his membership very seriously: in those years the group remained the most influential and respected association of artists. 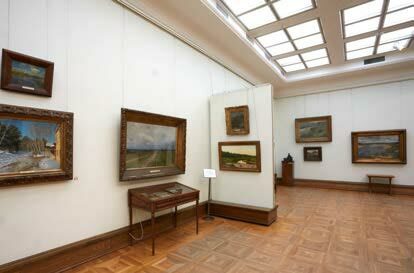 But, in addition to his participation in "Peredvizhniki" exhibitions, Levitan also showed some of his lesser works at a different venue, the regular exhibition of the Moscow Society of Art Lovers (MSAL), which opened on December 25 1892. Levitan was a member of the MSAL and had displayed his landscapes at its exhibitions regularly since 1888: it was one of Russia's most significant art groups, second only to the "Peredvizhniki" society. In 1891 Levitan was selected to join the MSAL committee; he was also a member of the society's commission which awarded prizes to the best works. At the exhibition which opened at Christmas 1892, Levitan displayed three works: "Summer Day", "Riverside" and "Twilight". All three had been created in the recent summer months near Vladimir, and all were bought by different individuals when the show closed. The destinies of paintings are difficult to predict, and it seemed that these pictures had passed from the view of specialists for ever, unrecoverable for art lovers. But one of these three paintings has returned from this oblivion - "Summer Day" (oil on canvas, 55.5 x 90.8 cm, with a signature on the bottom left corner: "l. Levitan 1892", from a private collection). In it the artist captures nature in a serene state on a quiet summer day as the sun falls, and the limpid summer dusk descends. The sun gently gilds the tree tops and the wavering contours of the forest, which locks into the horizon and stands out clearly against the still-light sky. But a dense shadow has already spread along the nearest edge of the forest, overtaking the distant shore, and is ready to move further, as well as the reflection in the water, to the nearest edge of the painting. 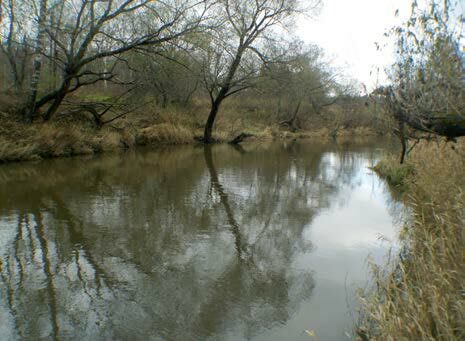 But for the moment our eyes relish the sight of the narrow river's gentle bend, its still water, and the river bank closest to us, with its irregular forms and grass fighting to grow up through the well-trodden soil. In this artless landscape motif Levitan discovers a wealth of simple elements and details that characterise not only the life of nature, but also the life of human beings in nature. 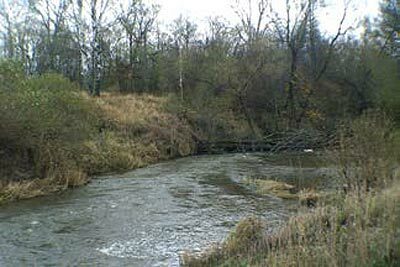 A footpath trodden over many years runs along the bank, then either skirts away from it, or retreats into the forest before once again rejoining the curves of the stream. The water seems motionless, but in fact passes around a small island in the centre, small waves lapping against the banks. Its agile brush strokes create the painting's rich and intricate texture: Levitan first "pits" the brush strokes against one another in the foreground, then applies paints in long "stretches" to the distant bank, finally softly "rounding" them off in the tree tops. It is the painting's "vocabulary" that conveys the richness and beauty of the natural environment which so fascinated the artist, as he masterfully represents in his landscapes his personal perception of the life of nature, its agility and volatility. "He is a true painter. 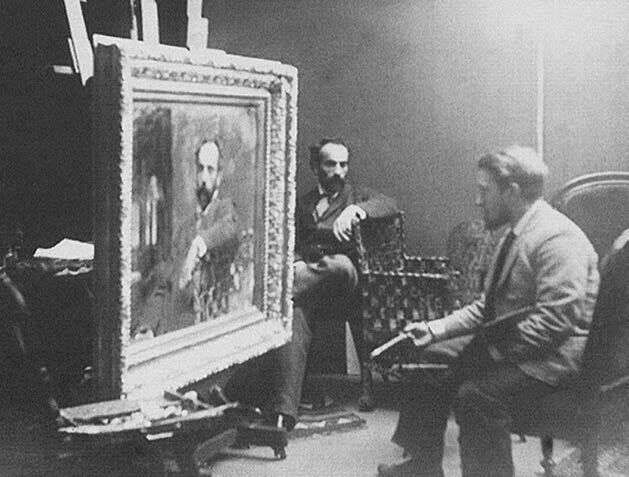 One of the few Russian artists to know how to enjoy the brush and the paint, how to paint not only correctly but beautifully [Benois' italics] as well. All his pictures are pure painting," wrote Alexandre Benois1. The gentleness of its colour combinations, coupled with an emphasis on shades of green, evoke those of Levitan's landscapes where numerous gradations of green, lit by the sun or obscured in dense shadow, show the special sensitivity of the artist's eye and his ability to take in dozens of gradations of the colour, one that is so hard to capture on canvas. 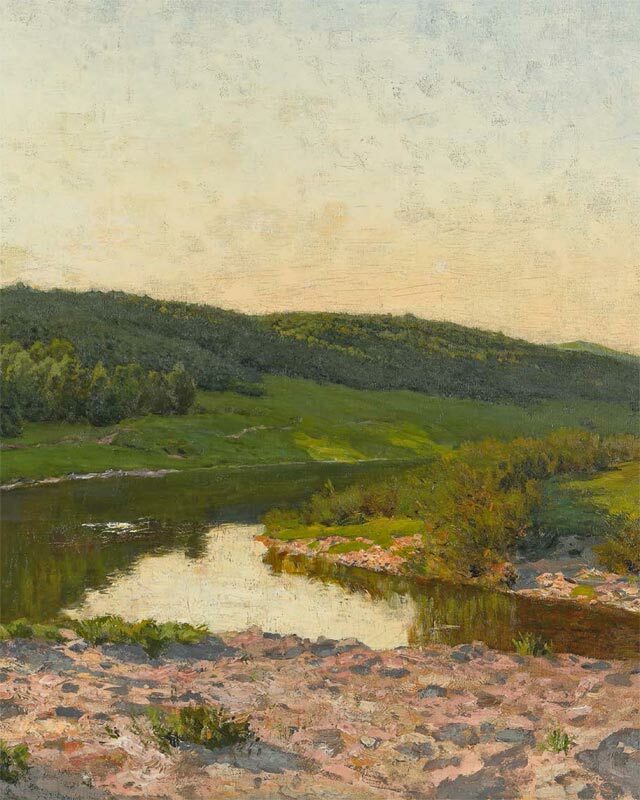 We know the specific location where "Summer Day" was created: the artist depicted the Peksha River, a winding stream with fanciful curves, which flows into the Klyazma. At times it runs lazily and quietly, then rushes ahead frenziedly - it was no accident that dams and mills had been built along the Peksha long ago. The village of Gorodok, or, as Levitan called it in a letter to Pavel Tretyakov, "the Gorodok estate", where the artist lived in summer 1892, has now merged with the village of Peksha. Levitan rented two rooms in the house of a wealthy peasant, A. Popkov, which stood on the high bank of the river, onto which its windows looked out, affording a view of a steep bank, as well as a meadow with sweet smelling grass, and the forest that skirted the village. A path ran between the trees, along the bank and down to the river. Much has changed over the years, but to this day this locality has preserved something of the spell-binding beauty that so enraptured Levitan. The scenery of the district provided the artist with a variety of stories and motifs for his landscapes. Whereas "Summer Day" is an intimate piece, the large composition "Forested Riverside. Twilight", produced at the same time and in the same place, looks monumental, formidable and full of dramatic effect. The mood of the latter painting, with its sombre and forbidding dark forest to which no familiar paths lead, and its dense darkness which seems uninviting in the extreme, makes the piece resemble the famous composition "By the Millpond", created a year earlier. 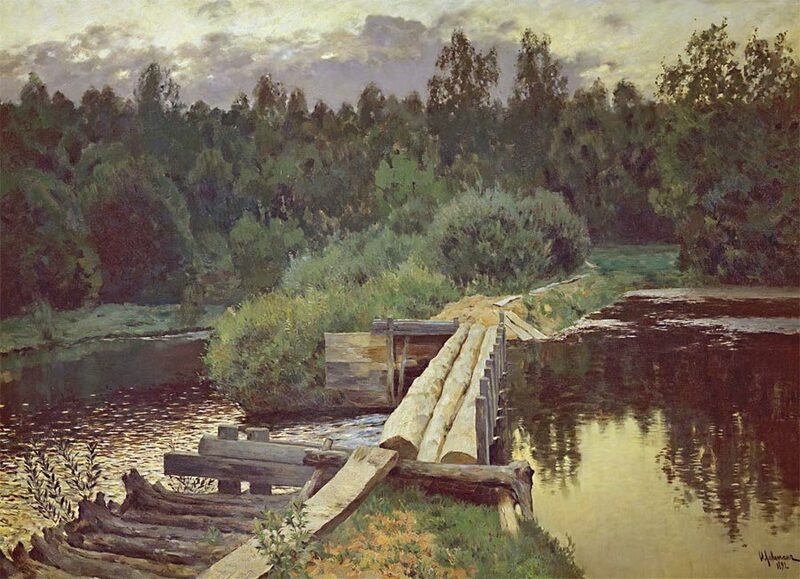 Finishing the latter piece after it had already been purchased by Tretyakov, Levitan, setting up his easel on the Peksha, near its dams where the river was especially turbulent, created sketches of the stream, bringing its image "to a more true-to-life" condition. It was done at the request of Tretyakov, who was dissatisfied with the depiction of water in the painting. The artist, for his part, asked the collector to postpone the varnishing of the picture until "[I] check the image against the scenery. Now I'll make several water sketches, come to Moscow late in May and begin re-working the picture," Levitan wrote from the Gorodok village2. 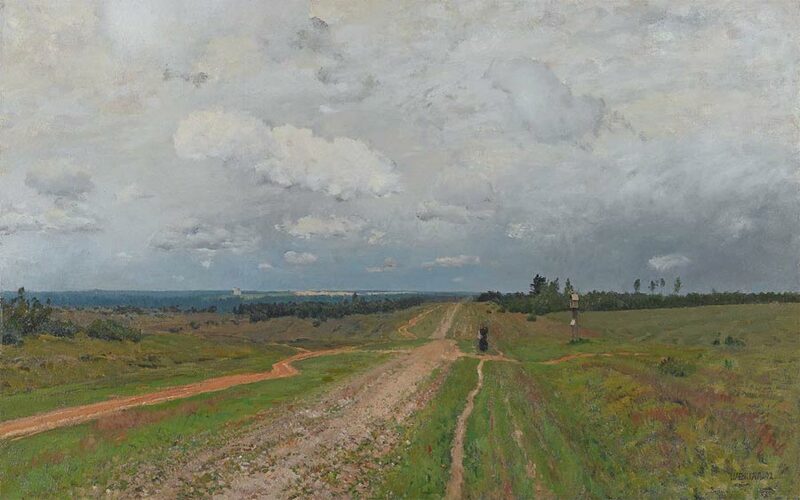 The painting combines a typical featureless, endless expanse of Russian landscape with the theme of the road, the path which embodies human life and fate. While "Forested Riverside. Twilight" and "Vladimirka Road" are rich in strong emotions, "Vesper Bell" (1892) is filled with complex and subtle feelings. The painter began this composition in a different place, and it is based on different visual impressions, but he finished it in the same year, 1892 - evidence of the diversity of Levitan's perceptions of, and connections to the world of nature. The scenery of the area near Vladimir inspired pieces as diverse as "Forested Riverside", "Vladimirka Road", and "Summer Day". Apparently, there were other compositions created in the area or from sketches made there. 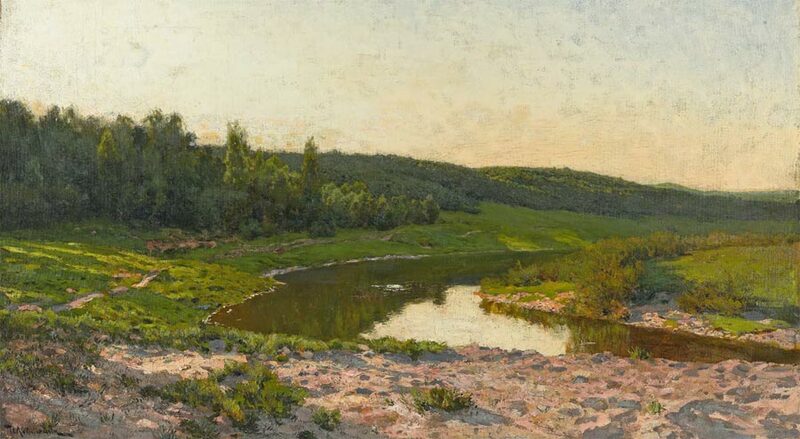 We recognise the fanciful bend of the Peksha and the sandy bank circled by its stream, as well as the terrain, in the picture"Village by a River" (1890s, Radishchev Art Museum, Saratov), "Silence" (1898, Russian Museum) and various other works. When Levitan liked a landscape, he would often use it, with variations, years later. The summer of 1892 was filled with painting and socialising with people who were close to, and interested, the artist. In the Gorodok village he made friends with Larionov, a modest landowner, and met with him almost daily. Larionov accommodated in his house Dmitry Kuvshinnikov, Sofia's husband, a doctor who had known Larionov, himself a doctor, for many years. Kuvshinnikov came to Gorodok in September, when he was trying to secure permission for Levitan to return to Moscow. The terrace of the small house on the Larionov family estate is featured in Levitan's composition "In the Summer House in the Dusk" (1892, Rostov-Yaroslav Open-Air Museum of Architecture and Fine Arts). There was good reason for Levitan to choose this area for his work: it was the location of many estates belonging to the Morozov family, the rich industrialists and landowners whom the artist knew well. Sergei Morozov was Levitan's devoted admirer and patron, and allowed him to use, free of charge, a comfortable studio with skylight in Moscow - few artists then were fortunate enough to have such facilities for their work (Valentin Serov painted Levitan's portrait in that studio). 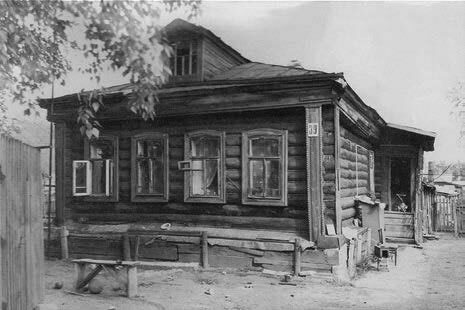 Sergei Morozov's sister, Anna Karpova, lived with her large family (she had 15 children) at a rich estate called Sushnevo, also by the Peksha River, several versts from Gorodok, where she owned land. The area was also home to the estate of yet another Morozov - Savva Morozov: he, too, was an admirer of Levitan's talents, whose collection included several landscapes by the artist. The artist was friends with this family, and often visited Sushnevo, and the Morozovs and the Karpovs owned some of his compositions. Among the friends of the Morozovs and the Karpovs was the historian Vasily Klyuchevsky, who spent summers in Sushnevo; the Karpovs were often visited by their relative Ilya Ostroukhov, the artist and collector who was Levitan's friend, and who owned some of his very best pieces. The scenic riverside of the narrow Peksha, the nearby forests, and the hamlets on either side of the river were depicted by Levitan on a number of occasions. He sensitively captured in his pieces nature's fleeting moments, matching them with the states of the human soul. The serenity and quietness of "Summer Day" convey a feeling of untroubled harmony suffusing nature, and provoking similar sentiments in the human soul. 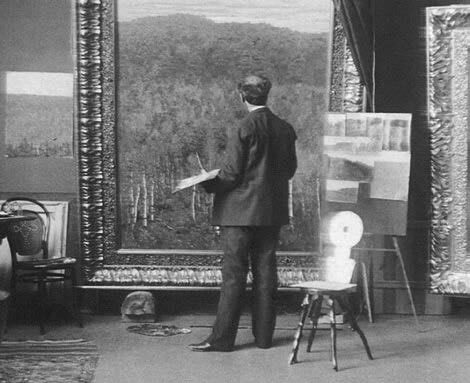 After being displayed at the exhibition in 18924, the picture disappeared for 120 years. But, if we follow the old adage, "manuscripts don't burn", we can hope that paintings don't vanish without trace either. "Summer Day" is presently on display in the Tretyakov Gallery's Levitan room, beside "Vladimirka Road" and "Vesper Bell", which were also created in 1892 - its composition in harmony with the other two masterpieces, helping us to see yet another very important aspect of the Levitan's artistic legacy, and affording a glimpse into this little-known chapter of his life. Benois, Alexandre. "History of Russian Painting in the 19th Century". Moscow: 1995. P. 350. Isaac Levitan."Letters. Documents. Reminiscences". Moscow: 1956. P. 42. "Catalogue of the 12th Regular Exhibition of Pictures Organised by the Moscow Society of Art Lovers". [Moscow: 1892]. P. 49.